"It's hideous, isn't it?" 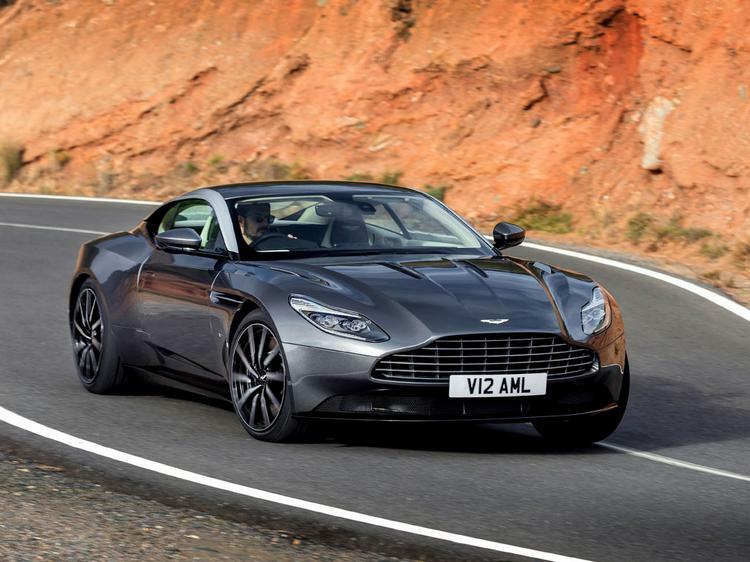 Matt Becker, Aston's chief chassis engineer, is talking about the baby blue interior trim of this hard-working DB11 prototype, but he might just as well have been referring to its tattered dazzle disguise - you'll never guess who makes the tyres - or indeed to the slightly feral smell that comes from the cabin. ...and a shot without the disguise! This is no pre-production show pony. 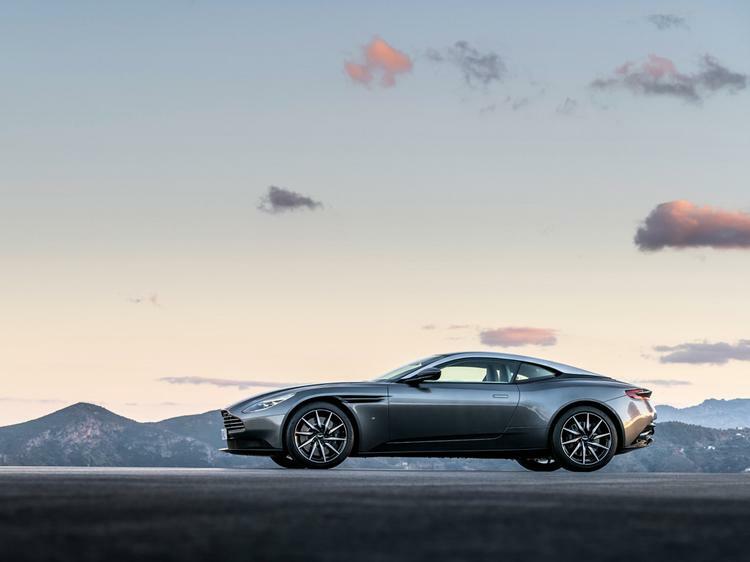 There's absolutely no doubt that this DB11 is a proper time-served test mule - even starting the engine requires a laptop to flash its prototype ECUs with the latest version of the powertrain and gearbox software. 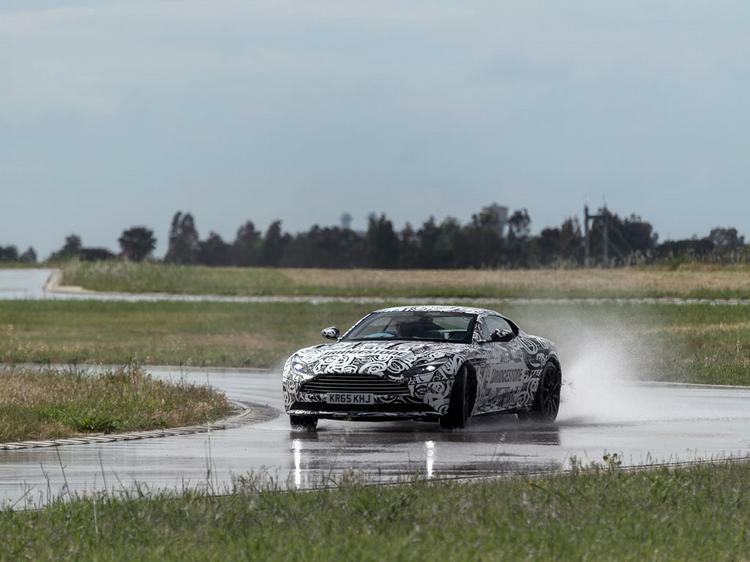 Aston has brought a group of us to the vast Bridgestone test track near Adria in Italy for an exclusive first turn in the new DB11, several months ahead of it going on sale, and while last-minute development is still being done on the car's software systems. 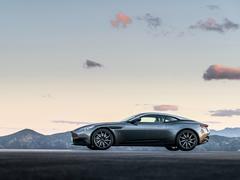 Becker is taking time away from his role as Aston's ride and handling supremo to give a personal introduction; there's no doubting what a vitally important car to Aston the DB11 is. Full credit for actually letting me have a turn in it; this isn't one of those passenger seat preview pieces. Even if spending time in it does mean having to get used to the Noddy's nursery interior colour scheme. Becker says that the company's prototypes are often finished in the hues that nobody actually orders. "They must have had a fair bit of this left lying around. I can't think why." Who is the tyre partner again? This isn't going to be an attempt at a full dynamic assessment or anything close to it; I spend about an hour driving the car with time split between a dry circuit and an ultra-slippery wet handling track. Becker drives the impressively three-dimensional track first, showing me where it goes over various crests and driving with the sort of effortless pace that reminds me he is probably the closest thing to chassis development aristocracy: before coming to Aston he was Lotus's head of vehicle dynamics. 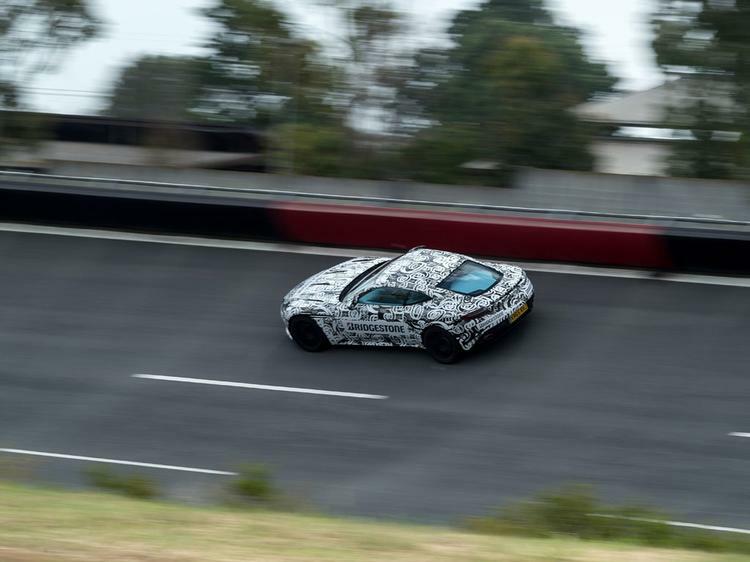 "We've designed the car to be easy to drive quickly," he explains. Well, we're certainly travelling fast and with little apparent effort from his side of the car. Now it's my turn. 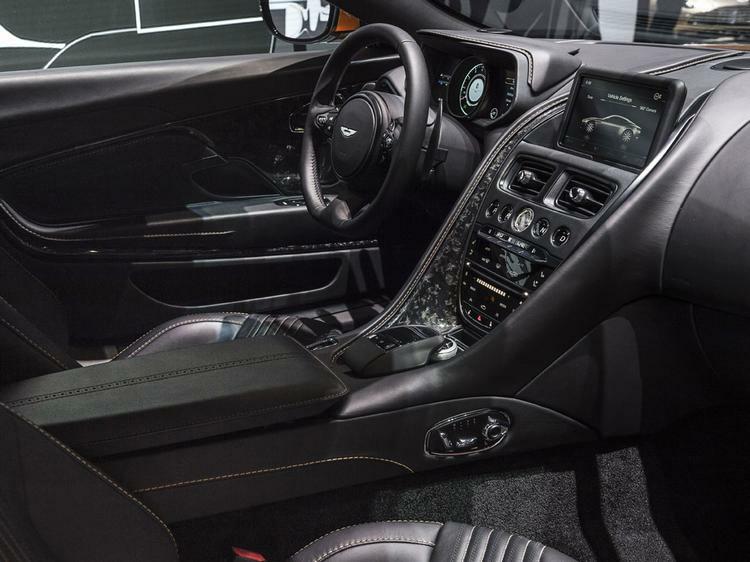 The low seating position and high glassline are familiar, as are the P, R, N and D buttons on the dashboard instead of a traditional gear selector. Much is new as well - the TFT instrument display has three screens, the central one being a rev counter, incorporating a speed readout. There's also just a single control stalk for both wipers and indicators, with the move to Mercedes electronic architecture reflected by some raiding of the Daimler parts bin. 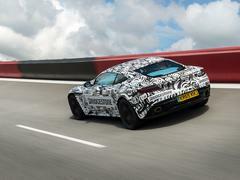 I notice that the prototype's key is a Mercedes one, complete with three-pointed star. The turbocharged V12 felt impressively powerful from the passenger seat, and it's no different once I swap sides. 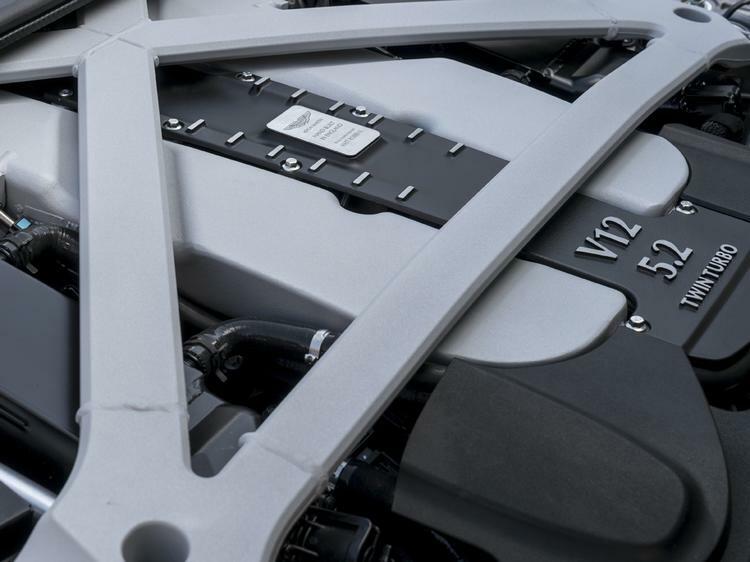 It produces vastly more torque than the naturally-aspirated V12 in the DB9 and has the full 516lb ft available from just 1,500rpm. Becker explains that - unlike Ferrari - torque output isn't inhibited in lower gears. There's almost no lag, to find a hint of delay I have to upshift in manual mode and then, with under 2,000rpm showing on the tacho, stamp on the throttle. Add a few more revs, or let the transmission stir things up with a downshift in Drive, and it seems effectively seamless, with the big motor pulling hard all the way to the 7,000rpm red line. No, it doesn't sound as good as the naturally-aspirated V12, with more bass and less wail. But then, with the possible exception of Keira Knightley whispering winning lottery ticket numbers into your ear, nothing sounds as good as the current engine. 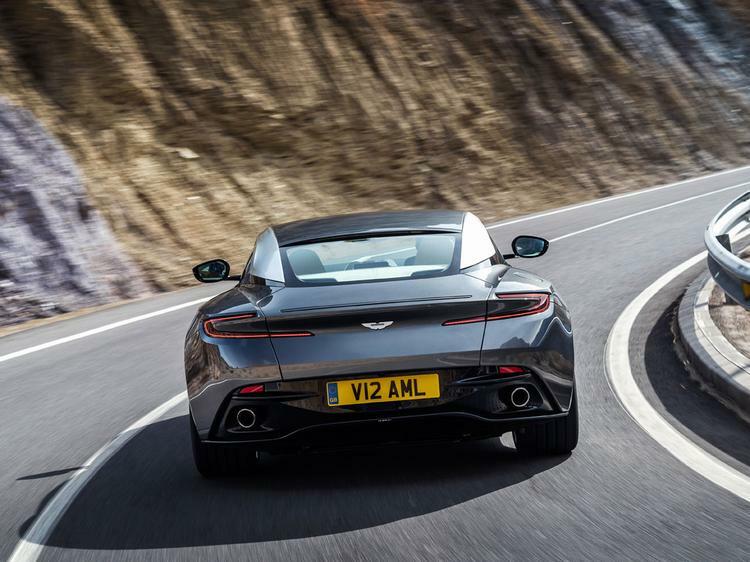 But even in what's certain to be its least-powerful guise the turbo unit feels a magnitude brawnier than even the current Vanquish. 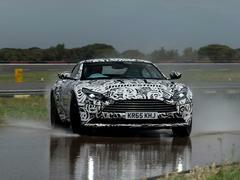 Aston reckons it will be 25 per cent more efficient on the official eco test as well. Equally impressive is the way Becker and his team have created a chassis that's capable of handling all the power and torque while still feeling impressive agile. 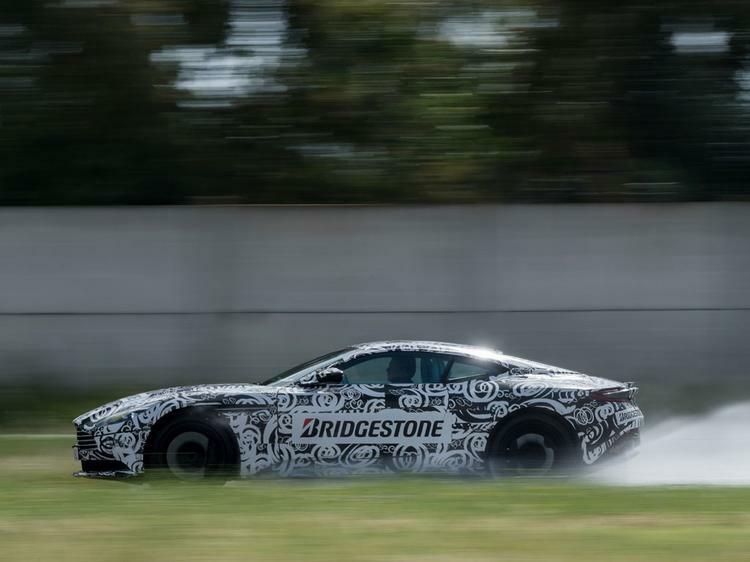 Those vast Bridgestone Potenzas produce serious grip but the prototype still feels light on its feet and keen to respond to steering inputs. The new electric power steering is properly good, Becker says a serious amount of time has been spent on making sure it communicates as if it was unassisted, and it yields the same linear responses that his previous employer would have been pleased by. Indeed, at a 9/10ths pace there's a notable lack of drama, even as an unseasonable shower passes over to dampen the track. The stability control does a nice line in almost invisible intervention and - in the gentlest GT mode - is able to digest big throttle inputs without making the car slide, or even feeling the bogging sensation of the engine getting wound back. 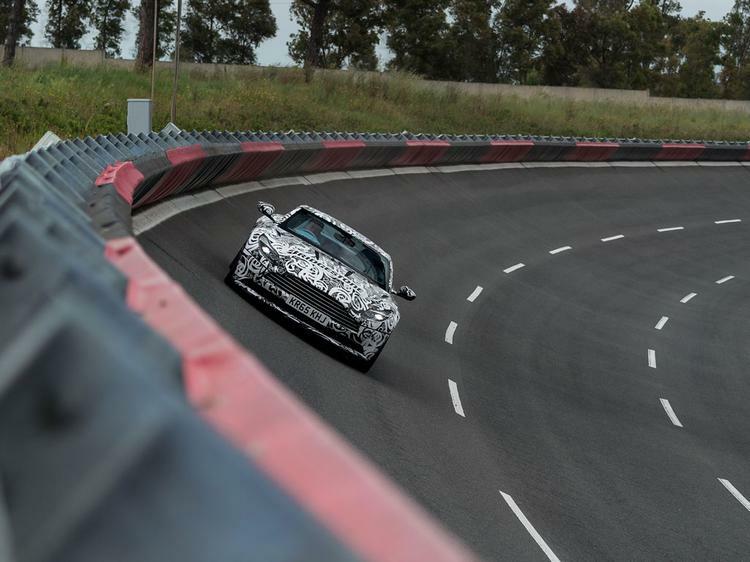 Attempting to carry too much speed into slower turns proves that the front end can run wide -settings for the brake-induced torque vectoring at the back apparently aren't finished yet - but for the most part it's as billed, good for travelling quickly without having to try too hard. The only real complaint is with the leisurely upshifts in manual mode. Becker says this will be tightened up by production, and also that the stroke of the paddles is going to be reduced. The track is too smooth to really assess ride quality beyond noting the DB11 feels pliant, even with the switchable dampers turned up to their firmest setting. 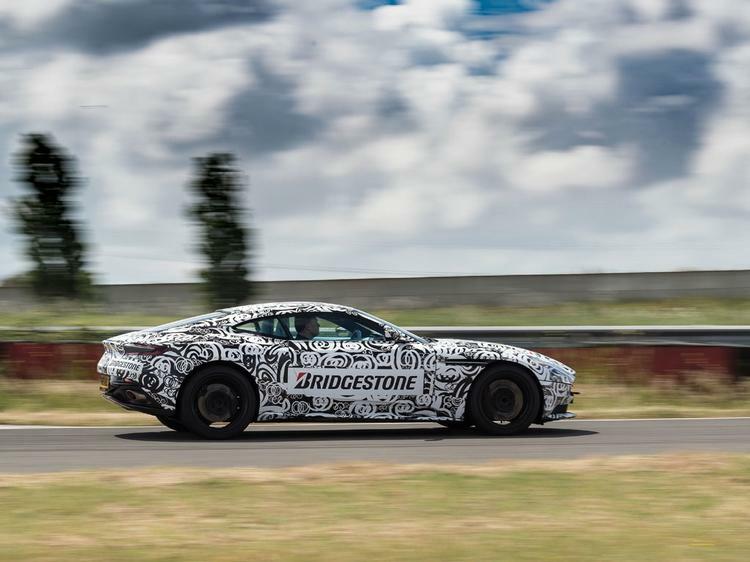 The brakes are worthy of praise - Aston won't be fitting standard carbon ceramics, but the prototype's steel discs - 400mm at the front, 360mm at the back - take consistent hard use without complaint. Next a trip to the wet handling circuit, which is shorter, tighter and - I soon discover - is as slippery as a politician looking for votes in a massage parlour. 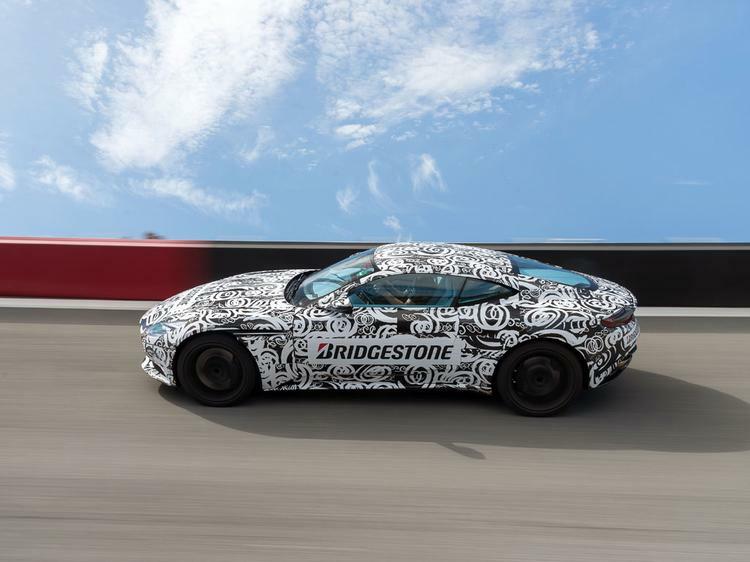 Now the stability control is really having to earn its keep, its intervention obvious as it tries to manage the engine's massive torque output. Turning the ESC into its more permissive Sport mode reveals just how hard the system was working, even the smallest throttle applications delivering the unmistakable sensation of the back end breaking for freedom, with a decent amount of slip allowed before it steps back in. Switching it fully off - as I'd expect approximately 99.7 percent of owners to never do - reveals the blindingly obvious fact that you need to be very careful with so much torque. 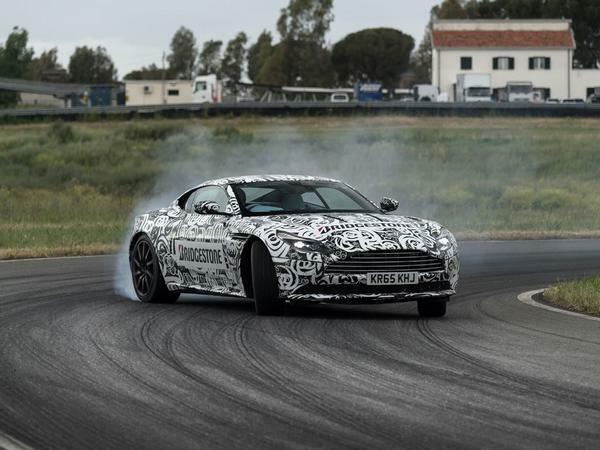 Becker takes the wheel to demonstrate that, with the right amount of talent, the DB11 can be turned into a proper drift machine and we do practically a whole lap travelling sideways. There's lots I can't tell you after my brief drive. 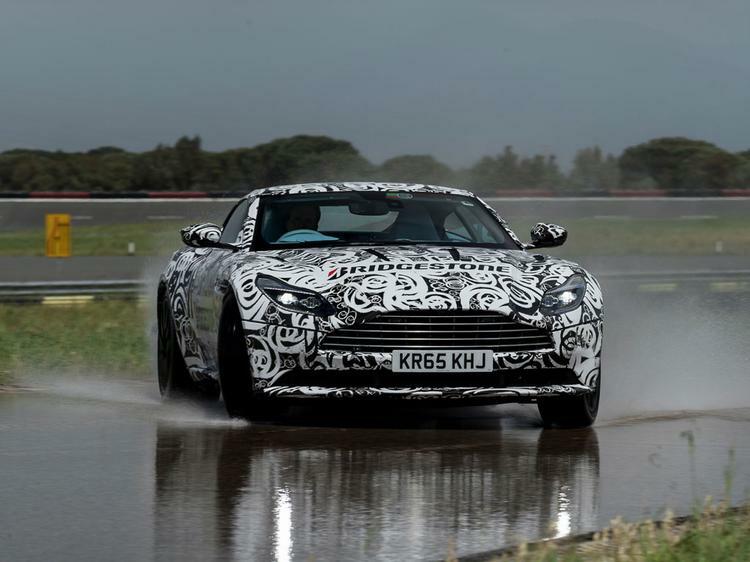 I've no idea how the DB11 deals with a rough surface, the urban crawl or high-speed cruising. I can't even say what the central display screen looks like, or how easy it is to navigate between functions, as the prototype's didn't work. I can safely predict that it will look vastly better when not wearing a camouflage disguise, and I hope that the production versions smell a fair bit fresher as well. The good news is that the turbocharged engine seems to be a good 'un, and that thanks to the work done by Becker and his chassis development team it hasn't completely altered the way the DB11 drives when compared to its predecessors. Come to it from a DB9 and it will seem faster and grippier, but the core Aston attribute of being fast and exciting without being scary seems to be intact. For that, we should be very grateful. 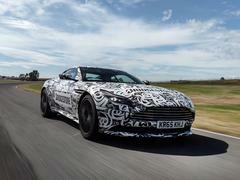 I honestly aspire to own one of these - I really like how they've moved the game on in terms of styling from the DB9 and am sure it'll be a real iron fist in a velvet glove (in a good way!) performance wise. 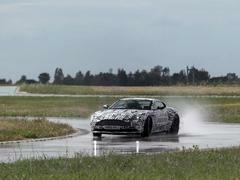 A turbocharged Aston Martin. Never mind its a Merc engine. It just seems highly uncouth to me. I quite like the blue interior! It's not a Merc engine; it's an in house Aston engine.